Startimes: New SR for Citizen TV on 3729.00MHz, pol.R: SR:10650 ( FEC:5/6 SID:117 PID:1171[MPEG-4]/1172 English - Clear). New PID for Citizen TV: PID:512/4112 English SID:1 (12578.00MHz, pol.V SR:3100 FEC:3/4 - Clear). Multichoice Africa: Citizen TV is now encrypted in Irdeto 2 (11862.00MHz, pol.H SR:27500 FEC:3/4 SID:7004 PID:151/153 English). New PID for Citizen TV: PID:308/256 English,257 English SID:1 (12578.00MHz, pol.V SR:3100 FEC:3/4 - Clear). New PID for Citizen TV: PID:256/257 English SID:1 (12578.00MHz, pol.V SR:3100 FEC:3/4 - Clear). 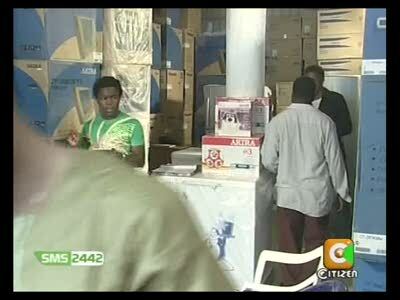 Citizen TV switched to Intelsat 20 (IS-20) satellite at 12575.00MHz, pol.V (DVB-S , 12575.00MHz, pol.V SR:3100 FEC:3/4 PID:308/256 English,257). New SID for Citizen TV on 12575.00MHz, pol.V FEC:3/4 SR:3100: SID:1 ( PID:308/256 English,257 - Clear). New SID for Citizen TV on 12575.00MHz, pol.V FEC:3/4 SR:3100: SID:2 ( PID:33/36 English - Clear). A new channel has started in DVB-S Clear: Citizen TV (Kenya) on 12575.00MHz, pol.V SR:3100 FEC:3/4 SID:1 PID:512/4112 English. Startimes: New frequency for Citizen TV: 3914.00MHz, pol.R (DVB-S2 SR:12096 FEC:5/6 SID:9 PID:191[MPEG-4]/192 English- Conax). Citizen TV (Kenya) broadcasts in DVB-S2 Conax on 3952.00MHz, pol.R SR:14580 FEC:5/6 SID:9 PID:191[MPEG-4]/192 English. Multichoice Africa: Citizen TV is now encrypted in Irdeto 2 (11881.00MHz, pol.V SR:27500 FEC:3/4 SID:15010 PID:201/203 English). Multichoice Africa: Citizen TV (Kenya) is now transmitted Free To Air (11881.00MHz, pol.V SR:27500 FEC:3/4 SID:15010 PID:201/203 English). Multichoice Africa: Citizen TV (Kenya) is now transmitted Free To Air (11881.00MHz, pol.V SR:27500 FEC:3/4 SID:15010 PID:2350/4350 English). Multichoice Africa: New frequency for Citizen TV: 11881.00MHz, pol.V (DVB-S SR:27500 FEC:3/4 SID:15010 PID:2350/4350 English- Irdeto 2). Multichoice Africa: Citizen TV is now encrypted in Irdeto 2 (11747.00MHz, pol.H SR:27500 FEC:3/4 SID:1408 PID:461/462 English). Multichoice Africa: Citizen TV (Kenya) is now transmitted Free To Air (11747.00MHz, pol.H SR:27500 FEC:3/4 SID:1408 PID:461/462 English).